Medical staff at an Atlanta hospital described the nature of the injury "as an anomaly," requiring pressure at a precise angle, the coroner said. A Georgia high school football player who died after suffering injuries during a game last month died of cardiac arrest as a result of a traumatic brain injury and the death was classified as an accident, the coroner said Tuesday. 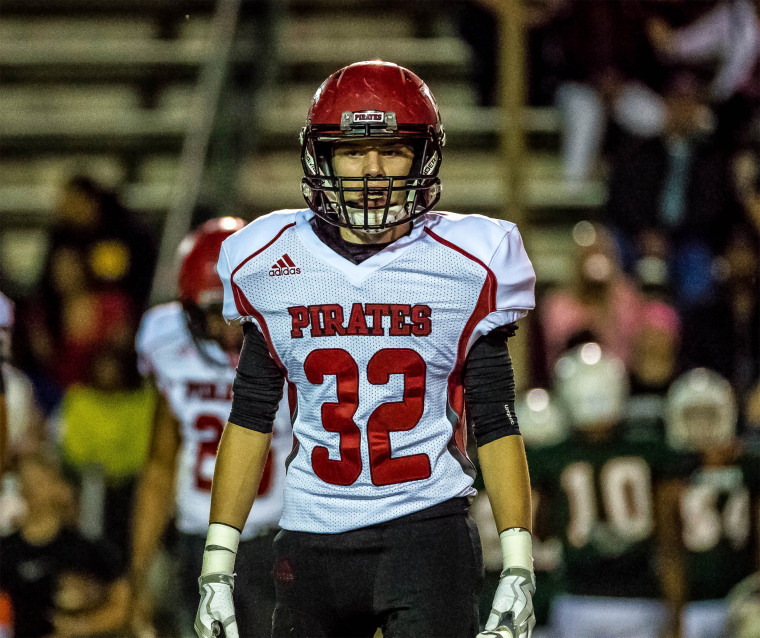 Dylan Thomas, a 16-year-old linebacker at Pike County High School in Zebulon, died after being injured in a Sept. 28 game and he was pronounced dead on Sept. 30, Pike County Coroner Terrell A. Moody said in a statement. The boy’s age had previously been reported as 17. "Dylan's official cause of death is: Cardiac Arrest, due to, or as a consequence of Traumatic Brain Injury, due to, or as a consequence of a Closed Head Injury," Moody said, and he classified the manner of death as accidental. Play was stopped for an injured player in the third quarter of a game against Peach County, Moody said. Dylan was standing, with assistance, and was able to verbally communicate with staff, but his condition soon deteriorated and he was transported by ambulance and flown by helicopter to a hospital in Atlanta. Dylan's uncle, Nick Burgess, told the Associated Press earlier in October that after the teen was hit he later collapsed on the sidelines when his arm and leg went numb. Moody said Dylan underwent multiple surgeries and other life saving measures over 40 to 45 hours at Grady Memorial Hospital in Atlanta before being declared dead. The determination of the cause of death was based on documented injuries and treatments he received, and after a crime lab determined an autopsy was not necessary, Moody said in the statement. Coach Brad Webber called Dylan, of Hollonville, "one of the finest young men I have ever had in my life" and "just an outstanding young man." His family said in an obituary that "Dylan lived life to the fullest. He was a true friend, who never met a stranger. He was a loving son and brother." Moody said in Tuesday’s statement that Dylan was a healthy 16-year-old and no preexisting medical conditions had been found in any physicals, or during treatment at Grady Memorial Hospital. He said that "Medical staff at Grady described to Dylan's parents the nature of the injury as an anomaly, requiring the perfect amount of pressure on the perfect spot at the perfect angle." The Georgia High School Association said in a statement last week that a review of the incident determined Dylan was wearing a brand-new 2018 Riddell helmet and that that helmet type is the highest-rated helmet that the company manufactures. The GHSA said there was no indication of any negligence and that "the coaches had taken every precaution to prepare for potential injuries and went beyond the required standards when working within the concussion protocol." "Pike County continues to extend its condolences to the family of Dylan Thomas during this time and in view of this unfortunate tragedy," Moody said. "The outpouring of love and support from the community and many others has been amazing." On Oct. 5, the first game played by Pike County High School since Dylan's death, players paid tribute to the fallen player before going on to win the game against Rutland High, NBC affiliate WXIA of Atlanta reported. Players from both teams shook hands and carried Dylan's jersey onto the field to take a knee, and other jerseys displaying his number, 32, were hung around the field, the station reported.